“Misery” is a continuation of the affection that grew from the band’s debut album, Employment. It’s a riot anthem whose lyrics skillfully skewer modern society while allowing Ricky Wilson, the lead singer, the opportunity to laugh maniacally over the persistent drone of the instruments. 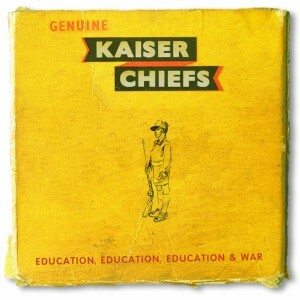 The song captures the line that the Kaiser Chiefs so often straddle, being a punk band with a message but creating crafty melodies and pop sensibilities. “I Predict a Riot” was the first indication of a pop savvy, angry punk band. The influence has carried to their fifth studio album to be released April 1. Ricky is using his voice to persuade a sing along, whether a subconscious attempt to prove the point of his lyrics, or an attempt to mobilize and push a group of otherwise wayward listeners to action.